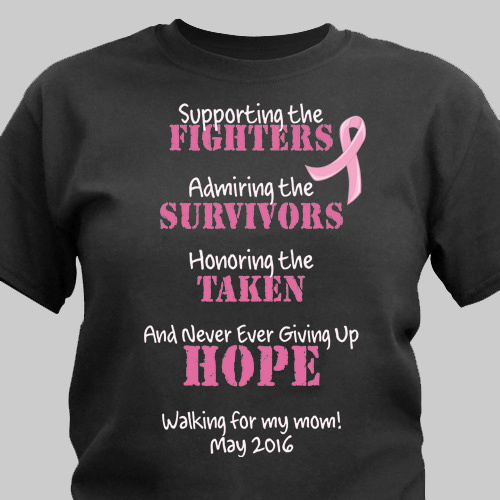 Our Breast Cancer Awareness T-shirt is a great way to support the fight against Breast Cancer. Share your message with Cancer Awareness T Shirts while educating everyone around you about the need for breast cancer screening. Love this shirt!! It's cool that I got to add something to it too! I love the shirt, as did Connie's daughters that I bought the shirts for. Love the shirt! and such quick delivery! GiftsForYouNow.com also has many additional Breast Cancer Awareness Gifts for your special gift giving needs. Each time a gift is purchased from our Breast Cancer Awareness line of personalized gifts, GiftsForYouNow.com will make a donation of 15% of the purchase price to help in the fight against breast cancer.